Last year around this time we were talking about Dragster, and how a 35-year-old world record was debunked and the record-holder got banned from high score competitions for life. 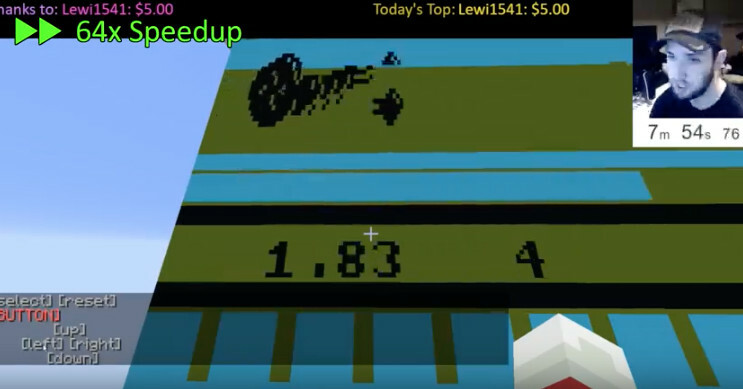 Well, someone — using an Atari 2600 emulator in freaking Minecraft, of all things — technically tied the legitimate world record. Technically being the best kind of world record, of course. What’s even funnier is this emulator renders at 1 frame per second. So that means YouTuber SethBling’s blazing fast time of 5.57 took about 15 minutes to complete. For the record, the time of 5.57 is held by 16 players on speedrun.com, six of them not in emulation. SethBling is not on the leaderboard, so it sounds like he hasn’t submitted this performance for review. The rest of the video shows how the emulator works with a variety of other Atari 2600 games. They’re playable, alright, with the slight qualifier that they are all slower than the molasses in January. But if you’re interested in seeing the Minecraft 2600 emulator all for yourself, SethBling has made the world available here.